Posted on August 13, 2016 August 13, 2016 by Aquanetta J. Betts, J.D. Join us– Church Leaders: pastors, deacons, ministers, bishops, elders, trustees, steward board members, etc. Learn about the benefits of planned giving as another way to fundraise – for the upkeep of the church, to assist those in need and build an endowment. Planned giving is a way to grow and sustain your church for generations to come. Find out why your church should have a Planned Giving program. 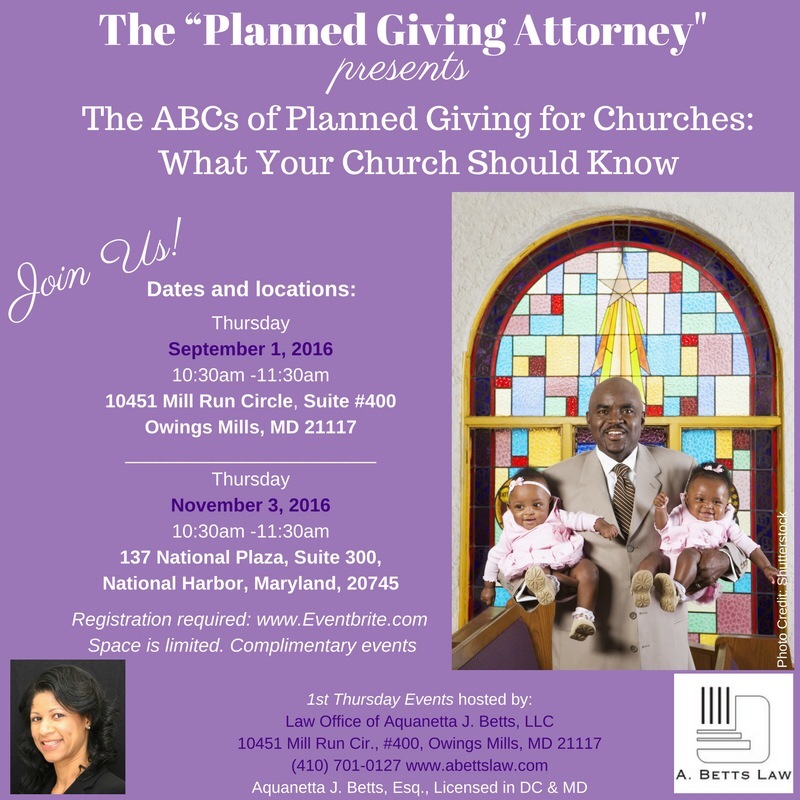 Owings Mills, MD, on Thursday, September 1, @10:30am – Register at eventbrite – click here. National Harbor, MD, on Thursday, November 3, @10:30am – Register at eventbrite – click here. We are also hosting a Free Workshop for Nonprofit Leaders on October 6, 2016, at 10:30am in Towson , MD – Register today on Eventbrite – space is limited. Feel free to share this information with your connections.